A year ago Facebook announced major changes to its algorithm spurring many of our clients to email or text us with questions on how the changes would affect their advertising. Is it even still worth publishing content to Facebook anymore? Instagram is the shiny new star and deserves some major attention in strategy and ad spend in 2019 but don’t count Facebook out. With the largest number of account holders and active users, it’s still a viable use of your time and money. When the news broke last year our first response was let’s wait and see. Facebook’s changes were poised to hurt companies with lower engagement more than companies with high engagement, but no one really knew where the platform would draw the line. With a year’s worth of data in our quiver, we’re talking about how these changes affected our clients this year and how you can use this information to improve your social media results. So the news isn’t all bad when it comes to impressions. Facebook’s focused more on engagement but we found all of our clients experienced a decrease in engagement ranging from 11% to 50%. It’s a hard pill to swallow but we’re constantly analyzing what content receives the highest engagement and continuing to produce more content along those lines. Medical clinics experienced click-through rates 150% higher in 2018 than in 2017. Our other clients experienced decreased click-through rates of 50% or higher. Video is just as hot as every marketer predicted it would be. Each of our clients had a video in their top ten posts for reach and engagement. Custom videos are great, but you don’t have to shoot new video yourself to have it rank high in reach and engagement. Share a funny GIF from another Facebook page and you can experience some of the same engagement and reach as a custom video. Personal photos are the number one way to improve reach and engagement. Celebrate your nurse’s birthday with a cake? Take a picture and share it. Welcoming a new staff member? Take their picture and share it. Find at least one event in your company each week that you can capture in pictures (or video!) and share it to your Facebook page. 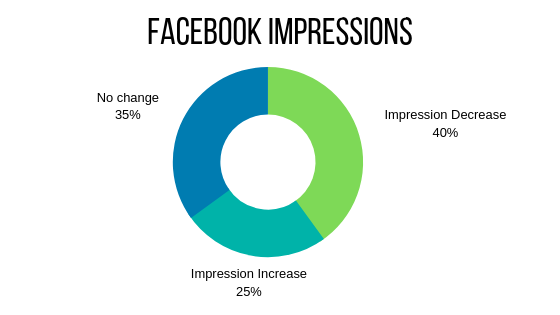 Increased status updates may increase your impressions. New clients who had low numbers or prior posts, low reach, low engagement, and low click-through rates experienced great improvements with consistent status updates. Increased posts will probably not improve your numbers if you already post once a day, but for those who have published consistent content, the pay off is still worth it. Need some new ideas to increase engagement? Download our ebook on Facebook Changes now.